I Review It So You Don't Waste Your Time! I don’t know what it is about Stephen King’s books that seems to make them so difficult to translate to the big screen – the recent success of IT aside (which I thought was a really poor film in comparison to the T.V Mini-series), there hasn’t been a truly successful Stephen King adaptation and unfortunately the 2019 version of Pet Sematary continues that tradition. I’m a big fan of Stephen King, and the Pet Sematary novel is a masterpiece of suspenseful and terrifying writing and the 1989 film version does a pretty good job of capturing the spirit of King’s novel – the sight of a creepy Gage wielding a scalpel is rather scary. So, how does the 2019 version hold up? Not very well I’m afraid. The film starts off trying to be a bit clever by alluding to the horrors that await (a poor script and bad editing being two of them) as we come across an idyllic looking house only to see a bloody hand print on a car window, a smear of blood on the porch and some footprints leading into the house, there’s then a clumsy cut to a car full of a cute all-American family traveling to a new life in the town of Ludlow, Maine. The film massively failed my watch test – I checked it 32 minutes in to the film which is a really, really bad sign that I am not interested at all. The plot is slow to develop, the scares a non-existent (save a few loud truck noises that I think have been included just to make sure you are awake) and the acting is pretty poor – so much so that I really couldn’t get invested in any of the characters except the cat – and if you can get acted off the screen by an animal then you really do have a problem. Father of the family, Louis Creed, is a Doctor who is tired of working a graveyard shift in a city E.R room so has uprooted his family to a sleepy town. As a city E.R doctor I would imagine that Louis has seen his fair share of horrific trauma and death which is why him being so distraught over the death of a teenager named Victor Pascow seems to be very out of character – does he behave that way over every patient he loses? If so I don’t know how he manages to retain his sanity. Later in the film, Rachel needs to be aware of the kid’s name so the writer’s shoehorn a scene in to explain how she knows it in such a clumsy way it makes no sense for Louis’ character. Mother of the family, Rachel, is a barely functioning basket case who is haunted by the death of her sister. How do we know this? She explains it to us in a conversation she has with her husband. Now, bear in mind these two are married and have a child aged 9 (and a toddler as well) so wouldn’t you have thought they’d have discussed this at some point before this? Well, not according to the writers! Yes, it’s important to know Rachael’s backstory but to have her talk about how her sister died to her husband of at least 9 years is so very, very lazy. I was hoping that the film would be rescued by the appearance of John Lithgow’s character of “Jud” but even he couldn’t pull this film out of the grave it had dug itself and was really just phoning his performance in, there was no depth to it at all even when he had some emotional points to talk about. I don’t think that’s Lithgow’s fault at all, he’s an excellent actor, I just don’t think the directors knew what they were doing half the time. The storyline revolves around the titular “Pet Sematary” which is on the family property and the creepy Indian Burial ground beyond (and we all know that they’re a great place to hang out, don’t we). When the family cat is hit by a car, it’s buried in the Indian burial ground and comes back – but it’s not quite the same lovable cat that the family knows. Then, when a further tragedy strikes and one of the children die, Louis is drawn back to the burial ground even though he knows the consequences and nothing good can come of his actions. I think the directors, set designer and lighting guy must have sat down and read “Filmmaking for Dummies” (yes, that is a real book) because if you want a horror cliche – you’ve got it! Fog in a forest? Check! Lightning and thunder? Check! Weird animal noises? Check! Random noises in the attic? Check! Doors opening and closing when you’re the only one in the house? Check! I could go on but I’m sure you get the picture. The first hour and a bit is a pretty pedestrian affair: the directors and editor missed lots of opportunities to add in extra scares and jumps which would have livened things up considerably but if you can get through that then the final 30 minutes turns into quite a passable film. I had avoided details of a plot change as I didn’t want it to ruin my enjoyment of the film (as limited as that turned out to be) and I won’t write about it here as I do think it takes something away from what is probably the best scene in the film if you know about it, but what I will say is that it allows for an interesting twist that I didn’t see coming and made for an intriguing end to the film. Click the following section to read my thoughts on the changes – spoiler alert obviously! So in the book and the 1989 film, Gage (who’s around 3/4 years old) dies and is brought back by the sematary. This was always a bit problematic for me as unless he totally sneaks up on you and hits you with a surprise attack or you’re asleep surely fighting off a toddler would be pretty easy – especially for a grown man. 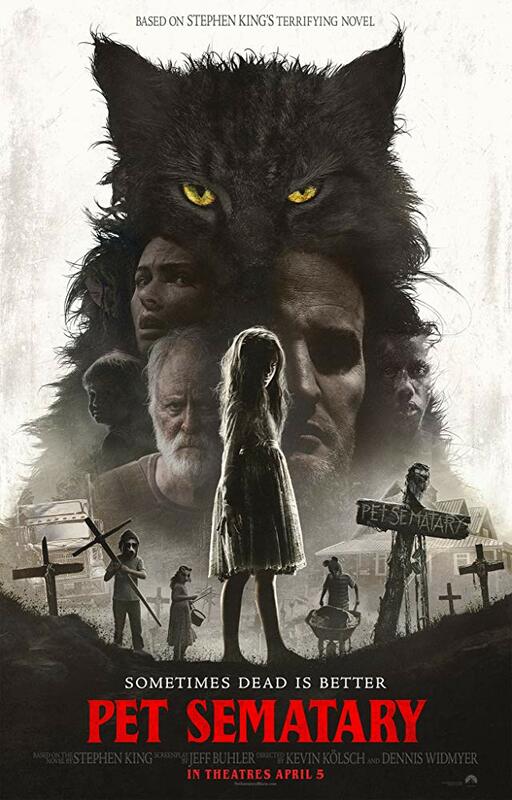 This version changes the dead child from Gage to Ellie who, at 9 years old (and possessed by the power of the woods), is a bit more of a formidable foe and the fight between her and her father in the “Sematary” is brutal and quite difficult to watch but it’s far more believable to be afraid of a 9 year-old than a toddler. Also, as I wasn’t aware of the change (I’d kept away from the trailer and all reviews) it made the scene when Gage runs out into the road more impactful as I wasn’t expecting Ellie to be the one to get hit. This switch was a welcome change and one that makes sense and partially rescued what was shaping up to be a completely dire film. Watch this film if you haven’t seen the original (or you’ll probably be disappointed) or if you’re in the mood for a movie starring a sassy cat. This site uses affiliate links to services such as Amazon. You won't be charged any extra for purchasing anything through these links but I will make a small commission on any sales.